Charismatic, courageous, contradictory…. and the ancestor of a shape-shifter. 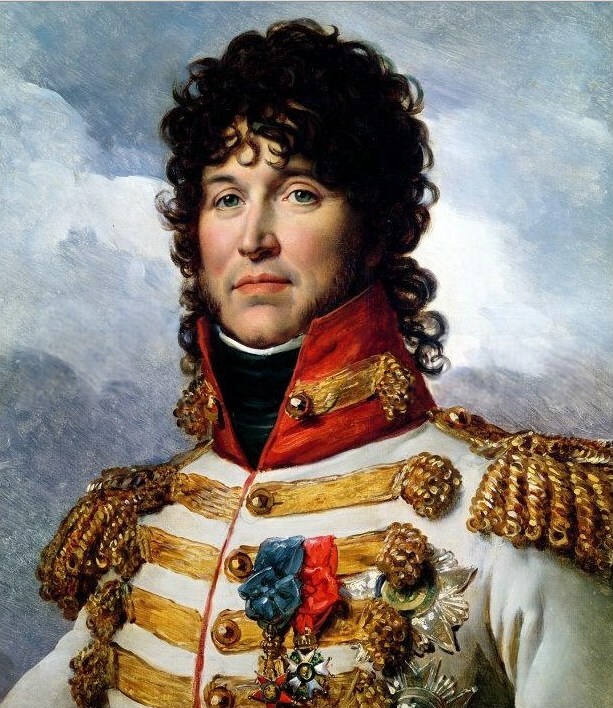 Joachim Murat, perhaps the most easily recognised character with his curly locks and flamboyant uniforms, came from humble origins like many of the brightest stars of the Napoleonic age, became King of Naples and died in front of a firing squad. An early confederate of Napoleon, it was Murat who provided the guns for the famous “whiff of grapeshot” episode in Paris when the young general Bonaparte helped suppress the Royalist rising of 13 Vendémiaire (1795). After promotion to lead Napoleon’s cavalry in Italy (1796) and then in Egypt (1798) where he cemented his reputation as a skilled and vigorous cavalry commander, he was included as one of the small retinue Bonaparte brought back with him from the Orient. His pivotal role in supporting Bonaparte during the coup of 18 Brumaire tied him closer to the First Consul and his marriage to Caroline Bonaparte at the beginning of 1800 brought him into the great man’s family circle. His handling of the French cavalry through the Marengo campaign won him more honours and, with his reputation and his marriage to Caroline Bonaparte, it was a certainty he would be named one of the first marshals in 1804. More success followed in the Austerlitz campaign of 1805 and by now Joachim Murat was feted as one of the most dashing cavalry commanders in an era of beau sabreurs. At Jena, the following year he again led the cavalry with great élan. The painting of him leading a charge during the battle, typically hatless, and armed with nothing more than a riding crop epitomises the dash of the flamboyant leader. But there was more to Murat than battlefield valour. His ruthless pursuit of the Prussian army after Jena-Auerstadt turned their defeat into utter disaster. But the Eylau campaign of the following winter would prove to be the high point of Murat’s military career. On a freezing February day in 1807 Napoleon was facing defeat at the hands of the Russians, his centre collapsing under the pressure of the Russian assault. He turned to Murat to save the situation and with typical flair he launched the entire cavalry reserve into a massive attack on the Russian formation. The famed “charge of the 80 squadrons”, fully 11,000 men in two columns crashed through the Russian formations, reformed a single massive column to their rear and drove through them again. The charge cost the French cavalry almost 1500 casualties but they devastated the Russian centre and bought vital time for the French infantry to reform and stabilise the situation. In 1808 Napoleon offered Murat the crown of Naples and much to everyone’s surprise the commoner proved to be a conscientious monarch introducing civil reforms and reorganisation of the army. It was four years before his brother-in-law called upon Murat’s services again; this time to lead the cavalry in the ill-fated Russian campaign of 1812. 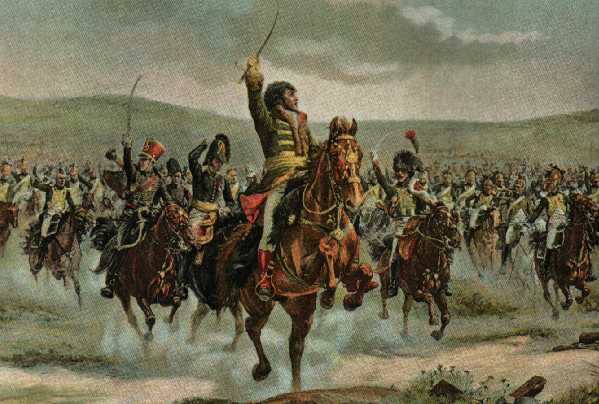 During the six-month campaign, Murat would constantly be in contact with the Russian armies and at the Battle of Borodino, he charged at the Russian guns at the head of 15,000 horsemen. During the retreat, when Napoleon hastened back to Paris, Murat was left in command of the Grande Armée but he did not want the command and his nerve failed him. Fearful for his kingdom, he lost his head, abandoned the army and fled back to Naples. His divided loyalties from this point seem to become more and more confused. He asked for Napoleon’s forgiveness for abandoning his post in 1812 and returned to command the Army of the South in 1813, but after the defeat at Leipzig that year he once more fled back to Naples and began to make independent approaches to the allies and signed a treaty with the Austrians. However, during the Hundred Days he realized that the European powers intended to remove him and return the Kingdoms of Naples and Sicily to their former rulers. At this Murat deserted his new allies and moved north to fight against the Austrians to try and strengthen his rule in Italy through military means but he was defeated at the Battle of Tolentino (2–3 May 1815). Desperate now, with barely a thousand men he gambled everything on trying to foment unrest in Calabria as a means of regaining control in Naples but the attempt was shambolic. Forces of Ferdinand IV, the former and newly restored King of Naples, arrested Murat at the port of Pizzo. Soldiers! Do your duty! Straight to the heart but spare the face. Fire! Joachim Murat had four children with his wife, Caroline. One of their descendants is their great-great-great-grandson actor René Murat Auberjonois. 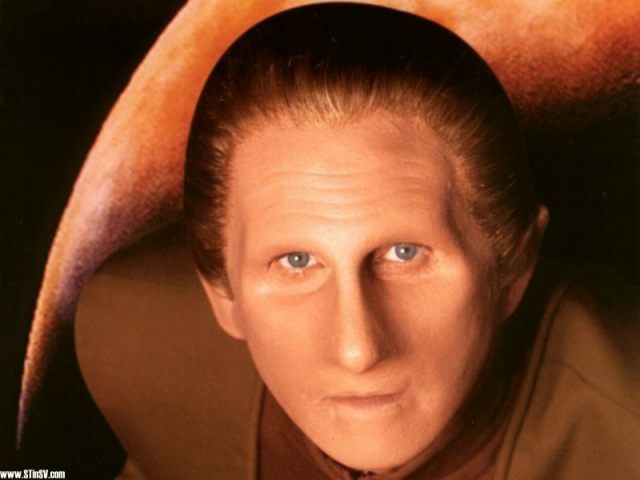 He has played many roles over the years but my favourite was as Odo, the shape-shifter in Star Trek: Deep Space Nine. You couldn’t make this stuff up you know!